On Sunday, we went back to the lake for the first time since the fall. We have avoided it over the winter due to the ice. Finally the ice is gone and even though it feels way to cold for me. Phod had a great time swimming. It was the first weekend that really felt like spring and we got to spend a lot of time playing outside. There was a little mischief. -The bird caused mischief by pooping on Lee (see yesterday's post). plants out of the yard and burned them. -The bee caused mischief by stinging Lee in the bum (and the people laughed and laughed at that). -Emma caused mischief by being here. -Phody and Lee caused mischief by running after the people biking down the road. -Phod caused mischief when he tried to drag Lee though the fire when they were tied together. -Phody says the people caused mischief by not playing ball and/or frisbee enough. He only got to chase it 87 million times. We can't wait for more spring! PS. Our Lady says thanks for all the nice comments about our house. We are very lucky to live in such a big place in the country. Our people really appreciate it and the trade offs they make to live here. Like the fact it is far to Lady's work (that is why they can afford such a big place) and it is a LOT of house to clean. Life is about making choices and these are things they choose to do! We are glad cause we have lots of room to run and play! Black and White Sunday and Exciting! A bird pooped on Lee's head! It is the first really nice weekend of the year and this happened. The people can't stop laughing at it! So we are thrilled to welcome our new cousins to the pack. We can't wait to meet them! This is Lupul, named after a hockey player keeping with that theme. He is about 1. He is very playful. This is Princess Panda (our Lady added the Princess part cause she thinks she looks like a princess). She was named by the Humane Society. She is about 3. She is a little bit shy and is not sure how to play with Lupul yet. They have only lived together for less then a day, so we will give them time to adjust. We are doing yard work most of the day, so we will pop by your blogs this evening. Mollie: Lady says over the next few weeks she will share more pictures of the house. She has to take them and is lazy this morning cause she got to sleep in. Here is a picture of the outside. First Emma had our Lady up at 5:30 am on a Saturday, which means as she is helping us write this, she is not the happiest Lady on the planet. She does have to work this morning but not for a bit and could be sleeping. Emma did not have a good evening with the housetraining. She sort of leaked poop everywhere. She did ask to go out but by the time our Lady would stand up, she would have gone. She spent time in the crate. She is actually in the crate as we write this because as soon as Lady lets her out, she goes on the floor, even if she has been outside. Lady is not in the mood to deal with that. Also, Lady had created some fun video of us, but for some reason, her computer won't recognize the camera and let her import it. She has learned this apparently Mac compatible camera, is compatible when it feels like and she can never remember what she did to get the videos off last time. After 30 minutes of trying this morning she is done. She will try later and you can see our fun video then. Now that we have shared all the grumpy stuff . . . . it has just been that kind of week, we will talk about our house. Thank you for all your comments about it. Our Man and Lady found a very special house for us last year. It was custom built by a young man who was a mason (so we have a 42 foot stone fireplace and a cool stone wall and the whole house is stone and brick!). He built it thinking he would live in it forever. But life changed. You see he designed a house with his dog in mind (laminate over hardwood floors, a heated garage for his dog to stay in) but never considered the possibility of kids. 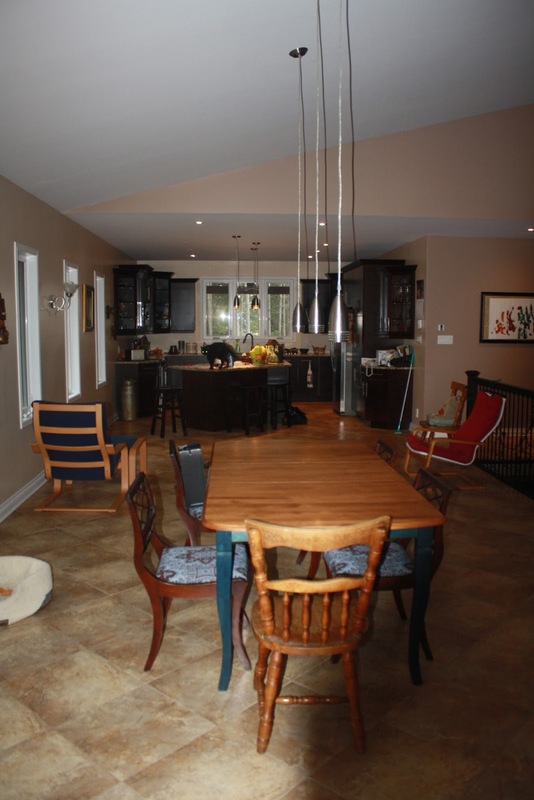 So while the house is huge (4200 square feet) the design is not kid friendly and it is far from the city. But all the uniqueness and vastness is why the Man and Lady loved it. Before living in this vastness, we lived in like a 1200 square foot semi-detached house in the city. It has been a big change, but one we love. I'm Nin and Lady said everyone wants to see the kitchen. I said "What kitchen is?" and Lady said she would help me put up some pictures. Enjoy! This picture is meant to give everyone some perspective on the location of the kitchen in relationship to the dining room table we never use (as we sit at the island all the time!). Look closely and Nin is standing on the island. Yes the cats are allowed on the island - why - because they are old. One side of the kitchen. The Man wanted to clean but the Lady wouldn't let him. Note the blue bottle. Lady had just got home from work when she took this picture. She picked up a new pet stain remover cause someone peed on the guest bed. The Lady's lunch bag is temporarily there, but that yellow bag has been sitting on the counter for like 2 weeks cause the Lady doesn't know what to do with it. The other side of the kitchen. Look at all that stuff by the phone. It just sits there. Walking update: We have been really good walkers this week.There haven't been as many deer and turkeys around so that has been helpful. We went 4 km the other day. We are working on improving our pace. Our Lady's goal is to be able to walk 1 km in under 12 minutes. This really prevents us from sniffing as much as we would like, but we are humouring her. Training update: For off leash training they have put a tie out on a garbage can lid. I hate this and try not to go out with it. They are making me and it is embarrassing. We are not getting enough trials of our indoor training to be mastering tricks. We are working on increasing that too. Any number of trials is fine for me because I get a cookie. Housework: Our Lady is laughing at Flea's comment about how clean and tidy the house looks. Our Lady says thank you. She also says taping in the dining area probably gives a false impression on the house work because it is always the cleanest part because we don't really use it. If she had turned the camera toward kitchen, you would have gotten a different view! Visitor: Emma is coming on Friday for a week yay! Then she is with us for all of June and all of July while Uncle Chris is doing military stuff. We are excited, not sure Lady and Man are as excited. First: We were excellent walkers yesterday. We pulled a little at the beginning when we saw the deer but after that did a great job. We are just trying to make Lady seem like she tells untruths! Our people think this is a fun game. Lock us in the bathroom so they can hide cookies and tell us to find it. We are very good at this game. We don't mind it because we get cookies. Here is a clip of it. Last week, Lady says we tested her patience with our walking. We were good Monday (which was good cause Lady was very tired) and Tuesday. As we got to the end of the road 10 deer went by. We lost our minds and went crazy. To prevent us from pulling her over Lady got herself around a tree. So she was hugging this tree and Lee was pulling one side and Phod another, and Lady's back got hurt and we wouldn't settle, so she brought us back to the house. She took us out later and we were good. She says this is extra good cause her back was really sore. It took a few days to feel better. Lady was leaving later so we went later in the day. She hoped by going later in the day we would not see deer. First we saw a cat. It was going into a house and we really wanted to go and see it. A bit later we saw a deer, it was exciting and we wanted to go with it. At about the same place as the deer there was this dead bird. Lee was pulling Lady toward the deer and Phod was pulling her the other way to get the bird and we twisted her knee a little (it was better the next day, so it was only a little). Friday Lady was away and Saturday was a miserable day here so we didn't go for a huge walk. Sunday we went with both our people for a training walk. It sucked. They made us sit and stay. They wouldn't let us pull. 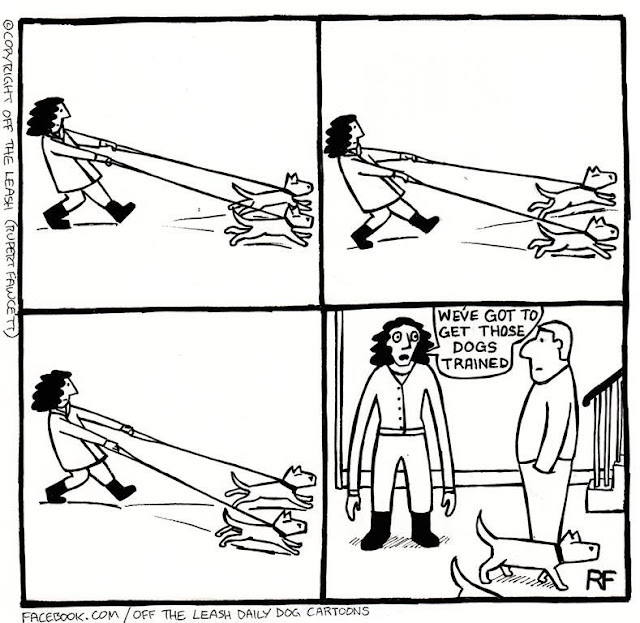 It is much easier for Lady to control one of us. Fortunately it is now the week and Lady will go out with us alone every morning. We will get to pull her. We already have today cause there was a deer in the driveway! Do you pull your people or are you great walkers? Our Grammie sent this to our Lady. Our Lady says this is us. We will write about our mischief walks tomorrow. My normal leaving routine is the same if it is for a night or just for a few hours: After the dogs are walked, the stairs blocked, and doors closed, the dogs get their greenies, I grab my bags and go. While I get some sad eyes sometimes, it isn't a big deal. Hailey rarely goes to the door to even see me leave. Phod usually does and I can see him watching me pull away. House secured, gave greenies, grabbed all my bags and Zaphod ran into the garage with me. I had the car door open for my overnight bag, and Zaphod, got in the car. (Regular readers will remember that he hates the car and we usually have to force him in). When I said "You are staying here" he did get out and go cower in the corner. I had to drag him back into the house. Then as I was trying to close the garage door, he was sticking his nose and paw in it so I couldn't close it. Hailey set to howling her crazy frantic howl. Zaphod was whining. I was finally able to push him back and get the door closed. I felt very guilty as I drove away, because I could hear them crying. Apparently while I was away they were fine. When I came home, they were happy to see me and Zaphod stuck to me more then usual. Not sure why this trip (I am usually away from home a couple of nights a month), set Zaphod off. I hope the next trip isn't as sad for them! Note from Hailey: While the last of the snow went away yesterday, we are pretending it is not snowing out today. It doesn't seem to be staying. For everyone who guessed the new paw in town was a raccoon, you were right. So far we have seen him in the field with the horses and up a tree near the horses. Our neighbours say he was on their front steps one night and would not get off, even when poked with a broom. Our Lady is worried there is something wrong with him. We think he smells excellent and perfect! We look forward to meeting him. It is now feeling like spring here. While it is cold in the morning around 0 C (32 F), it is warming up to the low teens C (or 50-55 F). There is still snow around, probably in part because on Friday we got hopefully the last snow storm of the season. We got about 15 cm of snow and rain (close to 1/2 a foot). Our lake is still covered in thin ice, so we don't get to visit it for safety reasons. We hope by next weekend to get to go. Our Lady is out of town tonight/tomorrow and says she won't have a chance to post a blog (we are giving her an F for blogging this week). Today we take time out of our regular blogging to send prayers to all those effected by the Boston tragedy. While this tragedy is far away for us, it was brought closer to home as Lady's BFF's dad was running it. Her BFF and her youngest son were also there. Lady had to wait for several hours to find out they were ok. They are ok because her BFF was running late cause she went shopping and her dad was a little behind where he should be thanks to a bathroom break and stopping to kiss the girls at Wellesley. 3 years ago the Lady went with her BFF and 3 sons to the marathon to watch her BFF's dad finish it for the first time, and to see the Lady's cousin run it. It was such a fun inspiring time. The Lady says this makes her feel even sadder. So today let's all take time to remember the victims of this and all other manmade tragedies. Perhaps the human species can start to work together to prevent these horrible things. Yesterday there was so much mischief in our house! First one of the visitors to our party for Aunt C was an almost 10 month old. Hailey hates the babies. She would just bark and bark at him. She had to go on her leash because she would run toward him and bark in his face. He thought this was funny, but Lady did not. Even after he went to bed at 7, she would sneak down to the guest room and bark outside the door. Lee was very stressed inspite of the fact some of her favourite people were here, she was very stressed. Then in the afternoon, Lady and Man slept for like 4 hours. Lady didn't let us catch up on blogs. She was too tired. All that night mischief caught up with her and Man. At 6 pm, Man took Lee on leash and Zaphod off leash out for a bathroom break. What Man didn't think about was it was 6, prime deer time. Phody spotted a deer and chased it and was MIA for one hour before Man found him in the bush at the end of the road. Man and Lady were happy he was home but not happy he had run away for so long. Then later in the evening when the peeps were watching TV, Phody jumped off the couch to go sniff Baggy and knocked a bowl on the floor with his big tail. It shattered. It was a huge mess we were not allowed to help clean up. Lots of mischief yesterday. Lady hopes today is a quiet day! Could have been the gin. Might of been the 3 or 4 six packs, I don't know, but look at the mess I'm in. Lee dressed in the party colours! This is the song Zaphod is singing this morning. He was very sick in the night and it could only be cause of the festivities last night. See, our Aunt C is getting married in 1 month. And even though we are not invited to the wedding, we thought we would help Lady throw her a party. So a bunch of girls came over and ate and laughed and played games. Then we had a big sleep over. While Phody was really sick in the night (perhaps having sympathy for the boys who were up to we don't want to know in the city last night), I, Hailey Bug am just very tired from all the merriment. I will write more about it later this week. I need to nap now. PS: I am glad to see that most of you have people who need a little more training! Lady does a great job at getting us daily walks. While they may have been a little short in the winter, we didn't want to be out there any more then she did so that is ok. Since spring, Lady has increased our walks to about 3-3.5 km. She has taken us to new places. Lady could work on providing more sniffing time and chasing the deer and turkeys we see. She also pulls sometimes, and should be mindful of this in the future. There are many times Lady jumps quickly and runs to the door to take us out. However there are the times that she wants to finish eating, finish in the bathroom, save a work document etc and she makes us wait. She needs to improve her speed. There is no excuse not to be at the door within 30 seconds of a scratch. Yelling "wait" is not an acceptable response. When Lady is in charge of feeding us, we rarely have to wait for our food. We get feed 15 minutes after we get up and at 6:30 pm. Great job! While Lady does an excellent job at providing a wide variety of treats, she can be a little stingy in her giving of them. She also often makes us work for them and do tricks. She should provide more for free. This is an area our Lady struggles with. She does not give us her undivided attention at all times. She does not play fetch for hours with Phod or give Lee hours of belly rubs. She should dedicate more time each day to practicing this if she wants to see her marks go up. In spite of her shortcomings at times, there is no denying that our Lady loves us. She lets us on the furniture and sleep in her bed. She gets up 1.5 hours extra early in the morning to make sure we are fed and walked. She has developed patience for us and tolerates our quirks. She has forgiven us for the worst things. While she has some areas to improve, we know that she couldn't love us more. If you were going to rate your people/person, how would they do? Keeping with our conversation theme this week, I have decided to have a morning chat with Nin. Every morning we have the same conversation, it goes something like this. Nin: Oh cruel, cruel world, where I have never been fed a day in my life. Lady: Nin you get food 4 times a day, I don't think you are starving. Nin: I don't remember getting food, so you must be telling me lies. Feed me before I fade away. Lady: Give me a minute and I will feed you all. Nin: Hurry I am fading. Lady did you know that in the night I had to sleep and it was dark and I was sleeping and maybe things happened and I don't know because I was sleeping and Baggy was sleep and you were sleeping and the Man was sleeping and the dogs were sleeping and you were in another room and I wasn't in that room and it was dark and there was sleep. Lady: yep, we sleep at night Nin. Nin: It is crazy and I am hungry and oh, here is food . . . . . .
From Lee: To our readers who are effected by this winter storm today (we are getting 10-15 cm and freezing rain, and it is really windy), we hope you are all safe. Lady: Well my boy, you have lived with us for just over 8 months and I thought I would check in and see how things are going. How are you liking living here? The blur returning from deer mind control. Lady: I love you very much and you make me very happy. You are my special boy. Unlike your beloved adopted sister, you have never made me question my decision to adopt you. Although, if you didn't want to drop your ball or rope toy in the bath with me, that would be good with me. Phod: Ok. I just want you to love me and be happy. I want everyone to be happy. I am really sorry that sometimes the deer or turkeys come by and use their mind control and make me run after them. I really don't want to, but their mind control is strong and I have to. Lady: I don't like when you run off, especially on the road, because I am worried you will get hurt. However, I know you will come back. Phod: Thank you for not being mad or hating me. I am always scared when I get free that you will hate me or beat me. Lady: No one who meets you could hate you. Phody, we don't beat dogs here. You don't need to worry about that anymore. What are your thoughts on FlyBall? Phod: Well first you give me a big pill that makes me have to poop, a lot. Then you put me in the car, which I am trying to learn to love to make you happy, but it makes me stressed. Then I get there and I am not allowed to sniff the other dogs. One has a scary bark, and I am afraid of him, so I get scared. The teacher yells a lot, and pushes me sometimes and I don't like that. I would like it if she was happier. Lady: I am sorry it is not your favourite thing. You are doing a great job there, even if you get a little scared. I admit, I am not enjoying this class as the teacher has a different philosophy then I have when teaching people. The world is full of different types of people and scary people and we have to learn to work with them. Phod: I know. But I like happy people best. Lady I love you very much and I love talking to you, but can we stop talking and play some ball. That would make me very happy! Note from Lee - it is my blog after all. My Lady has been being very mean and not letting me blog or read blogs because she has been working a lot. She has been using her free time to love us instead of blogging, which is good, but I miss you all. If she would only leave her computer at home during the day then I could do it myself. 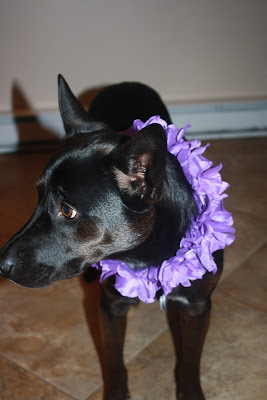 Wordless Wednesday - How you doin'? Lady: Lee I must tell you, you have been being a very good girl lately. You have been calmer, you haven't destroyed anything, we have even been able to do some off leash training. I am so proud of you. Lee: Thank you. I have felt like being good. Lady: Is there a reason you feel like being good now? Lee: Well after seeing Emma in action, I realized that bad could be really annoying. And she was so bad you got rid of her. I don't want you to get rid of me. Even though sometimes I am naughty I love you very much and want to stay here. Lady: We didn't get rid of Emma because she was bad, she was just visiting when Uncle Chris was away. She was only staying for a bit. Lee: That is what you say. How can I trust you? Lee: I noticed you have been going away a lot more. I don't like when you go away. Lady: I am away for 4 nights this month Lee. That is not too bad. They aren't all at once. Lee: I hate when you go away. It makes me so sad. Don't go. I will give you sad eyes. Lady: Well Lee, I took some work contracts out of town and I need to go. If I don't go, we won't have money for food and treats. Lee: On second thought, you should go away as much as you want and since you feel so bad leaving me, you should bring back lots of treats. Put the gosh darn camera down and let us sleep! Dear Blogville, we would like to call mischief on the Lady last week. First, she got this idea to play with the settings on her camera and took 87 million pictures of us. It really interfered with our napping. Then, she decided to feed us poison. Ok, that is a slight exaggeration, but this is what happened. As some of you might remember our Lady discovered that our cousin Emma has some food issues and she shouldn't eat food with grain. So we shared our grain free food with Emma. Our Lady had put us on grain free food for no reason other then she thought it was better for us (and maybe cause she is grain free too). Our Uncle Chris had brought lots and lots of food for Emma. It is a very good food, the food we eat except not grain free. Our Lady didn't want to see it wasted so she feed it to us. While it tasted very good, it made us both constipated. We had a horrible 2 days of this before she wised up and just mixed a tiny amount of grain food in. Now we are back to normal. We still get grain filled treats, they don't seem to upset our tummies. So the mischief of the week goes to her! Has your people ever messed with your food and your gut? 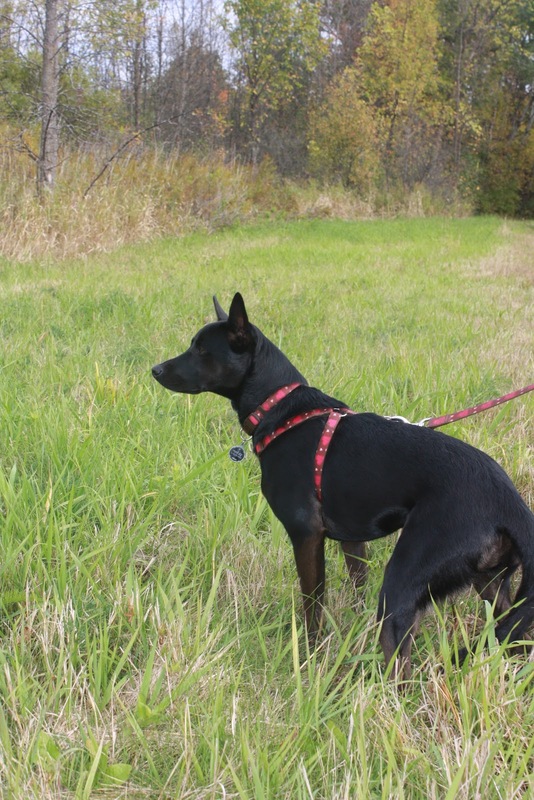 When you have a true mutt, you always are thinking "I wonder what she is" and looking for clues. Perhaps this is because the answer to "What kind of dog do you have?" is "mutt" and that doesn't sound so nice! 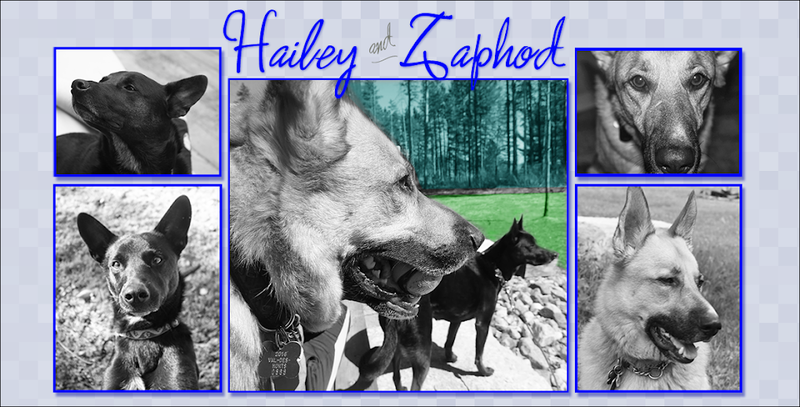 Zaphod is clearly not 100% Shepherd, but is enough that I can say Shepherd mix, so I don't think about it as much as Hailey. Hailey is truly a mystery mutt. I think every breed of dog has been suggested for her over the 2.5 years she has lived with us. Most people who meet her want to try and figure her out. 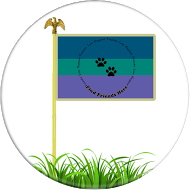 While we have considered DNA testing, we have decided against it because of the cost and the fact that only 75-100 breeds DNA is tested, which could still leave us wondering. Besides, we like having a little mystery in our lives! We got another clue a few weeks ago thanks to our friend Loki the Dober Dog. 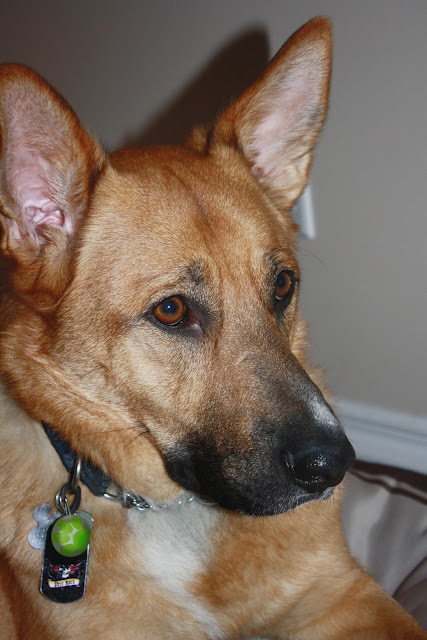 He too is a mystery mutt and his Lady is trying to solve this mystery. In her search she came across the Australian Kelpie. This dog looks so much like Loki, but a couple of pictures made me think of Hailey. Then I saw this one and I thought - That is my Lee. Similar colours, body shape etc. 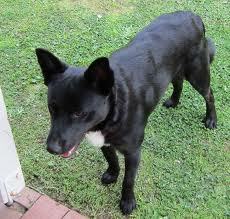 Google Picture of a Kelpie. Lee has the same white patch on her chest. My brief reading about this bread shows they can be a huge variety of colours, including black like Hailey. She is about the right size. She has the right type of coat. She is definitely a herding dog and has LOTS of energy. She has amazing eye sight and does like to nip ankles when playing. The physical evidence does suggest she may be part Kelpie. However, one mystery remains - how did my herding dog get webbed feet? Kelpies do not have this trait. Or at least it was not listed in the things I read. My guess is now she is a Kelpie (or another type of cattle dog) with some sort of dog with webbed feet (like a lab or shepherd. Given that she is drawn so much to shepherds I wonder if that is it). First we are sorry this is not a great picture, but our Lady says it is impossible to take the good camera with us on our big morning walks. She says her hands are full with us and if we see deer she won't be able to handle it all. The best we get on walks is the phone (unless our Man comes too and then maybe the better camera). She uses the phone to "map our walk" whatever that means and it fits in her pocket. Since it is spring now (although it is still cold here and the ground has the last of the 8 feet of snow we got this winter), our Lady has been working extra hard to get us out walking for longer periods of time. She did a pretty good job at getting us out almost everyday in the winter, but due to the weather it was not always as long as she was liked. Now that it is spring she doesn't have to worry about us pulling her over on the ice or her falling. The roads now have shoulders, making them safer to walk. Two streets over (about 1.5 km or 1640 yards) is a huge steep climb up the mountain. Our Lady has decided that we are going to walk to the top of that hill (which is about .5 km long) at least 2 times a week. The first day we did it last week, our Lady was very slow and panting and said something about wanting to die. The 3rd time she said it was much easier. So apparently she is easy to train. She says she now doesn't mind the walk up so much. We sort of help pull her up and she always is looking forward to the view up there. However, she doesn't love the walk down (with our sniffing and pulling and the lose gravel). She says we will be working on this. For now, we are just enjoying going out walking for longer periods of time. It is not as cold (even if the temperature has been in the minuses) and there are lots and lots of great smells. When we are lucky we get to see our deer friends. We hope everyone else is enjoying spring! We were really thankful for the time we spent with our cousin Emma. We were sad to see her leave last Saturday. While our Lady and Man are enjoying the quiet, we miss her. She was fun. We look forward to having her back soon. Here we are playing. We can't understand why our people miss don't miss this fun! First, our Lady would like us to take a minute to tell everyone that today is World Autism Day. This is a cause that is near and dear to her heart cause she works with people with autism. If you know someone with autism, give them an extra big hug from us. 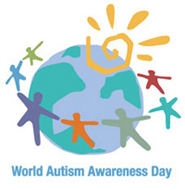 If you don't and want to learn more, here is a good place to start: http://www.autismspeaks.org/what-autism/world-autism-awareness-day. Second - the fun for us stuff. As many of you may remember a couple weeks we got our Mollie Box. (FYI, it is Mollie's birthday today, so a special happy birthday to her!). Our Lady has been mean and has only been giving us things slowly from the box. She says she got the box for Phod's birthday and we were lucky to get things early. So far we have gotten the toy squirrel which is in 3 pieces because that is what happens when 3 dogs play tug at the same time but it was so great and we loved it; A toy pig, which our Man has had to fix a number of times which we also loved; raw hide cigars, that took Phod a long time to figure out it was too chew, he just sat guarding it. Yesterday cause it was Phod's birthday we got to try these really yummy treats with berries in them that once Phod figured out were food, we both love and Phod got this new toy. Here he is playing with it. 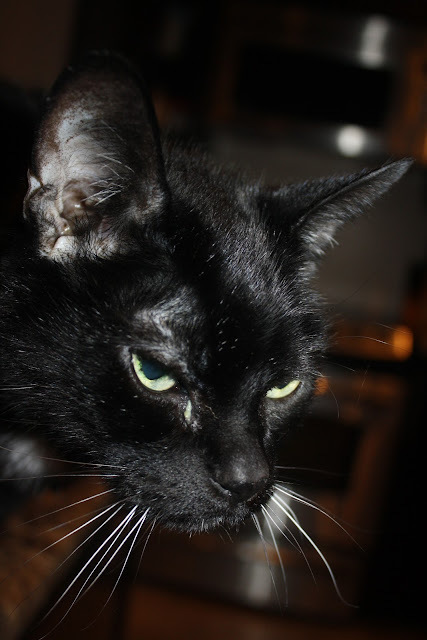 Zaphod was found as a stray so his exact age and birthday are unknown. While we will also be celebrating his Gotcha Day in August, we thought our boy should also have a birthday. So we have chosen today, April 1st to be the day we celebrate the birthday of our boy. We picked this day because he is our goofy fool and it is also Auntie Kaitlyn's birthday. So Happy 2nd Birthday Zaphod and Auntie Kaitlyn! Wishing you both many, many more! "Lady I don't care if you want to play with the manual settings on your camera, just let me enjoy the sun." "Being 2 is serious business!" "There better be treats for this."